The source is a spring south of West Bagborough Farm, west of Evercreech. The elevation of the source is approximately 68 metres above sea level. 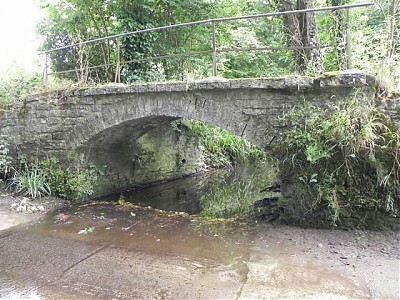 From the source the river flows north westerly for approximately 1 mile to flow beneath the A37 at Street on the Fosse. The fall over this first mile is just 1 metre. The river turns to a southerly direction to flow below the disused Somerset and Dorset Joint Railway embankment. Turning west, the river flows through Breach Wood before turning north to flow back beneath the SDJR embankment. The journey continues through the Sheppard Pitt Plantation before taking a westerly direction beneath the Pylle Road. Continuing it meanders through Sleights Wood, flowing again beneath the SDJR embankment before reaching Cockmill. The journey from source to Cockmill, where the elevation is 33 metres above sea level, is approximately 2.75 miles with a fall of 35 metres from source. At Cockmill the river flows beneath an 18th century stone arch footbridge providing pedestrian access over Cockmill Ford. From Cockmill the river flows north westerly for approximately 2 miles through the Glastonbury Festival site to the south of Worthy Farm. Before reaching and flowing beneath Steanbow Bridge which carries the A361, it flows beneath numerous bridges constructed especially for the Glastonbury Festival, including Bella's Bridge constructed in 2010 in memory of Arabella Churchill. At Steanbow Bridge the elevation is approximately 13 metres above sea level a fall of 53 metres from the source. By the time the river reaches the Hartlake River where the elevation is just 6 metres above sea level, it has travelled an approximate distance of 7.75 miles and fallen 62 metres from the source.